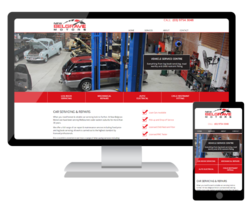 The team at New Belgrave Motors have been providing automotive servicing & repairs to Belgrave, Ferntree Gully and suburbs around the Dandenong Ranges for more than 30 years! Recently moving to a new location in Ferntree Gully means they now have a much larger workshop that can meet the growing demands of the local community. For the new website we established a clean informational website that is modern and easy to use. Important information about their services is easy to find, and some of their many great testimonials are prominently displayed - along with a large map to quickly spot the workshop location. Be sure to check out the website, and if you are live in the area and are due for a car service, give Cindy and the team a call.